I had the pleasure of meeting Juliana, an Ottawa mom who took on the challenge and invented an improved nasal respirator that helps clear congestion. Her product, Snottie, clears the nasal air way so your little one can breath better during a cold or flu illness. I've tried this wonderful product on my 3 year old daughter; who has yet to master blowing her nose properly! Snottie is now part of our routine, with zero fuss! I cannot thank Juliana enough for creating such a gentle product. I invite you to learn more about Juliana, Snottie and her own goals as a parent in my interview with her! I’m a mother to one sweet and talkative little girl named, Alecia, who is 3 years old. I grew up in beautiful Ottawa but was born in Penang, a tropical island situated on the northwest side of the Peninsular Malaysia. During the day, I develop strategies for treatment of cancer at the Ottawa Hospital and by night, I run Snottie Babycare in addition to “playing princess” with my Alecia or reading “The 3 Little Pigs”. As a new mom, I love meeting other moms, hearing their stories and making new friends. Oh and if you happen to love the BeeGees’ classics, you’ll have me dancing. I’ve enjoy the oldies! After having my baby, she began having many colds with a runny nose. I found myself worried, feeling helpless, and constantly wiping her nose causing even more inflammation. I wanted to do everything that I could to help her decongest so she can sleep and feed better, not waking up tired or miserable (even for both of us!). I started trying out many different products to help with her congestion from using the doctor-recommended bulbs to leading snotsuckers, electric aspirators and everything in between, but I found tremendous difficulty and limitations in all of the offerings. Either the tip was too big or too hard for her nose, or the ineffective suction or the need to constantly change filters. It was inconvenient, especially for travel, that I had to keep track of the number of filters we had to last us throughout our trip (and I travelled quite a bit for work at that time). It was then that I knew I wanted to do something. To create an effective solution and make a difference. To be completely mummy-approved. A genuine solution that works and so I can spend less time worrying about unnecessary things and spend more time with my baby (or myself when she is sleeping). The new quest took a lot of courage and persistence for a newbie like me but my belief in delivering a working solution was stronger. 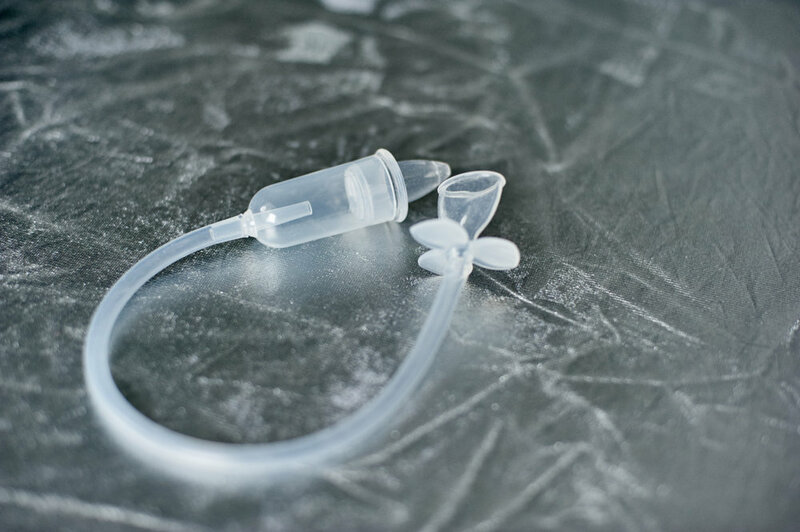 Three years later, and testing the end product on my little one, Snottie nasal aspirator was born… and I am excited to share my discovery with all parents out there. If you had to list only one benefit to Snottie, what would it be? For babies, Snottie is by far the safest nasal aspirator from birth and beyond. The key safety feature is the small, soft and round tip designed to avoid poking baby’s nose. Also the use of medical grade silicone material throughout to ensure softness and anti microbial properties and it is dye-free to minimize baby’s exposure to potentially harmful chemicals. For parents, it is the most convenient one in the market because you can remove mucus without spending a dime on any consumables, thanks to its filter-less safety cover design. As well as, cleaning takes less than a minute because there are only two simple steps - open and wash! No complicated manuals or sterilization procedures. If you have any advise to give a new mom, what would it be? The early months with baby can sometimes feel long, but the famous saying “time flies” holds true and we need to remind ourselves to cherish the time because there is no “repeat” option. As women, we bring life and we give unconditionally from the day our baby is born. So, give yourself a pat on the back everyday because motherhood doesn’t come easy. Every woman is truly amazing and special. And I want every woman to know that Snottie stems from motherhood – to really help your baby feel better and in return allowing you to worry less, sleep more, take more “selfies”, or do something you love! If there was one thing you wished to remember about your child today, what would it be? and why?! I wished I had professional photographs taken for Alecia’s milestones. All I have now are daunting piles of digital images and videos on phones and computers waiting to be organized. And with all the backups that we have; I don’t even know where to start. Hence, I’m making sure that we have a professional photographer for her fourth birthday! I look forward to having those memories on the wall and photo books to look back on every day!